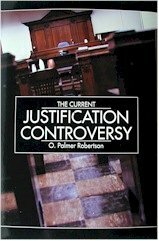 The Current Justification Controversy by O. Palmer Robertson (Trinity Foundation) 98pp. The word “Current” is a little misleading since this a publication of a paper that was written in 1983. It refers to a theological conroversy which occurred between 1976 and 1983 at Westminster Theological Seminary, Philadelphia concerning Norman Shepherd. Robertson goes through the steps leading to Shepherd’s dismissal from the seminary. In doing so he lists the perceived problems of his teaching in the areas of justification, covenant, election and assurance. Interesting. The Auburn Avenue Theology edited by E. Calvin Beisner (Knox Theological Seminary) 325pp. These are the papers from a colloquium on the “Federal Vision” involving both advocates and critics. I always find these formats frustrating: one person writes a paper on one topic and then a critic writes one in response. The trouble is that the first paper raises questions for me which the respondent fails to answer! I was disappointed in the interaction between Rick Phillips and Steve Schlissel on ‘Covenant and Salvation’. They talked (wrote?) past each other. I enjoyed the contributions of Carl D. Robbins in particular. I will probably say more about this book later.